Lovingly crafted from natural linens, the pattern in the front is digitally printed, and the back is made of natural plain linen. This sustainable product is handmade in the UK. The English bridge cushion pattern is inspired by bucolic paintings of the English countryside. The lush trees by the Victorian bridge and stream recreates the picture perfect rural countryside. Mix the beauty of the scenic cushion with the simplicity of the geometric cushions to create contemporary country living style. The woodland cushion is the epitome of romance and depicts the beauty and striking colours of the English forests. Take home this mini-canvas inspired by the lush trees, fauna and flora of the magnificent English woodlands. This scatter cushion with its soft tones of green, lilac and yellow makes the perfect addition to country cottage decor. The Swiss mountains cushion features a classic view of the Swiss Alps from a train window with blue skies, charming chalets by the lake and immense mountains. The linen cushion is the perfect accessory for a log cabin by the lake. Style it with cozy textured cushions and throws, pine wood panelled walls and open fire, to recreate the cosy Swiss chic chalet look in your home. The red lake cushion is one of chocolate creative’s bestselling designs in the Romantic collection. The autumnal landscape reflected on the lake is beautifully captured in the textured image printed on natural linen. 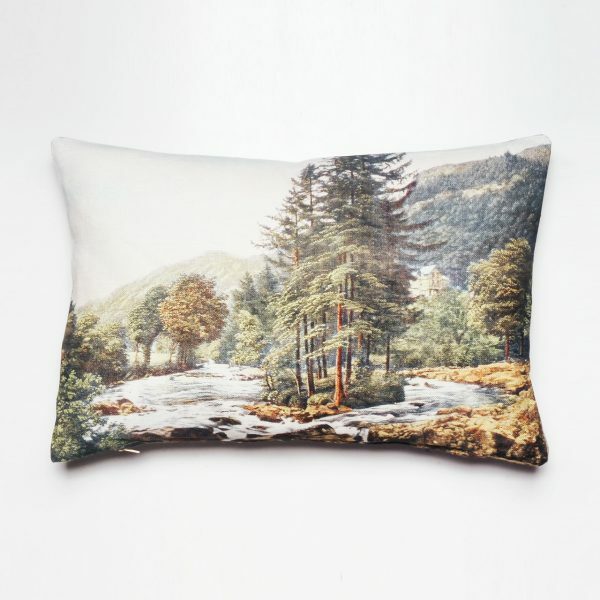 The red lake cushion evokes the mystery and beauty of the Scottish lochs and adds a touch of vintage glamour to your home as well as providing essential comfort to any sofa or bed. The vintage beach cushion allows you to enjoy a beachside view even when the sun has gone down. The faded colours of a sunny sandy beach are digitally printed on this delightful linen cushion. If you fancy running with the nautical theme, mix this design with sky blue stripes and natural linens. If you have ever visited Scotland, surely you have been captivated by its mesmerising landscapes? Take home a piece of stunning nature with the blue lake cushion which a serene scene by a pale blue glittering loch. Mix the blue lake cushion with some tartan fabrics in the same colour scheme and add textures with soft warm lambswool blankets and throws so you can cosy up highlands style. The English valley cushion takes inspiration from the lovely valleys you come across in the rambling English countryside. This scatter cushion is digitally printed in natural linen and handmade in London. Bringing the colours of spring indoors, the English valley cushion is a beautiful addition to any living room or bedroom. Combine with soft natural linens in pretty pastel shades of pink, green and purple and fresh seasonal flowers from the garden to recreate the romance of the country at home. The English coastal cushion features a rocky sandy beach and is an ideal addition to a seaside retreat or a stylish souvenir from your beach holidays. Whilst living by the seaside is a pipe dream for most, it is possible to recreate coastal charm at home using a colour scheme of whites, light grey, blue, and touch of red and accessorise with reclaimed furniture, old boat paintings and English coastal scenery cushions. Be aware that the hand made collections are hand made individually and because of the nature of the process, colors and pattern may vary from cushion to cushion. We do our best to match the photos with the original products, but please take in consideration that due to individual color screens settings, colors may look slightly different to the real product. Kitchen door knobs and handles. This is a made to order product. The bespoke orders take an average of 2-3 weeks, plus the extra transit period, normally one week to the UK/Europe, two weeks rest of the world. Sizes: Round: Diameter 5cm, Depth: 3.4cm Rectangular: Depth: 3.4cm Width: 2.5cm High: 5cm Square: Depth: 3.4cm Width: 5cm High: 5cmMaterial: Beech wood and eco water based paint and varnish. Email us at: margarita@chocolatecreative.co.uk for more information. Hand screen printed by Margarita Lorenzo in South London. Each print is signed and numbered. Colour: black Edition: 25 Size: 50x70cm (20x28 inches) Materials: Fabriano Italian art paper, 300 grm, and water based inks.Packaging: The print will be rolled and packaged in a strong postal tube. Once you have received the print, let it settle flat before you frame it. Sold unframed but it will fit many standard high street frames. * Due to the nature of the hand printing process, each print may vary slightly from each other. * All copyright and other intellectual property rights in and relating to chocolate creative products are owned by Margarita Lorenzo. If your home is ruled by colour then these bright geometric cushions will fit right in. Featuring a mosaic design and a striking combination of yellow with pastel blue and pink - these cushions will make a colourful addition to your sofa and living space. COPYRIGHT © 2019 | CHOCOLATECREATIVE | MARGARITA LORENZO | ALL RIGHTS RESERVED.